Our axes are carefully handcrafted with a skill that is taught only through experience and time. Hults Bruk blacksmiths work in pairs shaping the raw steel in a deft merging of force, timing, and perfect cooperation. As part of the hand shaping process, the steel axe head is struck multiple times, thereby increasing its density and resulting in greater durability. The head is constructed with a tempered zone designed to hold a very sharp edge even after repeated sharpenings. The same traditional care goes into milling our solid American hickory handles into specific shapes, each adapted perfectly for a specific use. Finished axe heads are hand-fitted, meticulously inspected, and finally fitted with one of our custom leather sheaths to protect the superb cutting edge. Watch our video for a start-to-finish peek inside the process of creating the world’s finest axes. 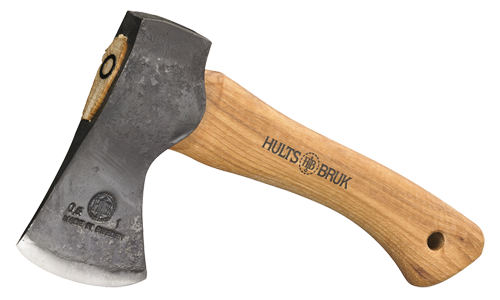 The Hults Bruk Almike is a small all-purpose axe. The Motala is a heritage piece harkening back to Scandinavian ancient history. The Sarek is a solid splitting axe, intended for heavier duties such as splitting logs and wood. The Atran is a felling axe intended for bringing down or cutting up small to larger sized trees. The Bjork is a larger splitting axe intended for heavier duties such as splitting large logs or processing wood for use in a fireplace. The Gran is a small splitting axe intended for lighter duties such as the basic splitting involved with making fireplace wood. The Kalix is a compact felling axe intended for bringing down or cutting up small to medium sized trees. The Salen is a compact, all-purpose hatchet for basic uses such as making kindling, doing light clearing and working in the garden. The Tarnaby is a small, all-purpose hatchet for basic uses such as making kindling, doing light clearing and working in the garden. The Torneo is a compact felling axe intended for bringing down or cutting up small to medium sized trees. A two-sided (coarse/fine) stone in a convenient leather carrrying case.